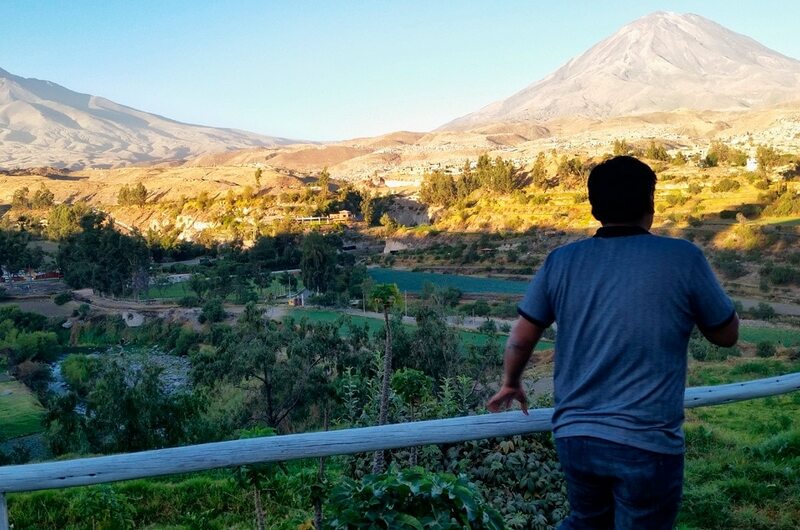 The average tourist in Peru, when thinking about volcanoes, probably has in mind the ones in the city of Arequipa. Beautiful Misti, Chachani, or Pichu Picchu are impressive ones and give the whole area an exceptional character. You can see them long before you get to Arequipa. If not the volcanoes, the landscapes surrounding the area would not be so spectacular. However, those are not the only volcanic attractions worth seeing in Peru! There are thirty-six volcanic cones awaiting you in a place called the volcanic valley of Andagua (Valle de los Volcanes). They are quite different, and located in a completely different setting. For me, the place is very unique. That is why, I would like to tell you more about this part of Peru where you can do trekking in the volcanoes. Valle de los Volcanes or Valle de Andagua is located in the Arequipa region. It covers the area at the heights between 4300 and 1350 m.a.s.l. There are several dozen of volcanic cones, ranging in height from 10 to 300 meters. They create astonishingly beautiful landscapes, satisfying even the most demanding travellers. Is the trekking in the volcanoes (in Andagua) for everyone? Definitely not! 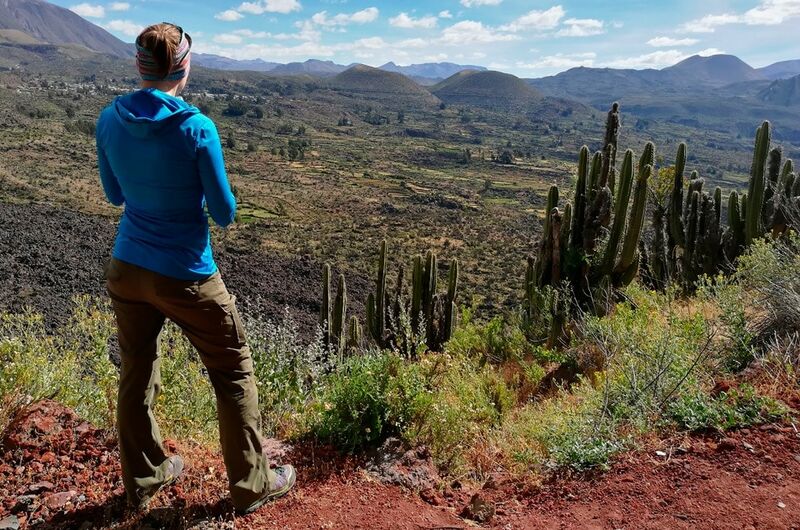 This place is ideal for lovers of landscapes, who want to explore Peru without the crowds of tourists, and for those who appreciate the local way of life. In my opinion, this is an attraction for the most persistent ones. Why is it the case? There is one simple reason for that. Getting to this place takes many hours, and if you do not have a four-wheel drive car, the journey will be quite painful. The route to the Andagua go through the unassembled roads. What does this mean in Peru? Lot of inconvenience. The hole is chasing a hole. You will find it extremely hard to omit them. The local bus driver is trying to avoid at least the deepest ones so that the passengers do not jump up too high. Oh yes, a local bus tour is a real massage for certain parts of the body. Forget that you will be able to sleep on this ten-hour bus ride. I did not manage to. My body was throwing in the air like a catapult. Once higher, once lower. Complete disaster. You probably wonder if such tortures are worth the trip. As for me – definitely yes. However, at the same time, I need to point out that not everybody will remember the trip with a smile on his face. Therefore, I do not recommend visiting the Andagua Valley for those who prefer luxury and comfortable way of travelling. The alternative would be a four wheel drive car. Although, it is very expensive, it will definitely be more comfortable. There are many trekking trails in the Valley of the Volcanoes. It is therefore an ideal place for all those who love mountain hiking. Although the trails are usually not marked (except for the viewpoints), you can easily reach amazing places with the help of a local guide. Andagua is also famous for horse breeding. Whoever loves horseback riding, I recommend coming here even for couple of days. Would you like to visit the volcanic valley of Andagua and do trekking in the volcanoes? Please write to us, we will help you prepare your trip or arrange everything for you.